When I put JEFBOT Vol. 2 together collecting these comics sometime next year, someone remind me to create a “These Comics May Contain Strips from the Website” Spoiler Warning wraparound as a pre-order bonus. Also: I’ll have a proper blog post about it in the next day or so, but I wanted you all in the BOTcollective to know that I’m going to Hawaii for a week starting tomorrow (Wednesday)! I’m still hoping to have content for you this Friday and next Tuesday (if not a comic strip, then sketches and/or pics from my trip) but I won’t be able to do much replying to comments until I get back sometime next week (although I’ll still be reading ’em!). Please help maintain order while I’m away, and check the site often, as my plan is to be blogging regularly about my adventures on Oahu! Oooh, spoiler warnings on a book that’s 50 years old! That seems…almost silly. Like putting spoiler warnings on a Shakespeare play or something. And yes, I agree, that does cross a line. ha! Shakespeare plays are next, T, mark my words! Huzzah! They’ll help protect my eyes from the Midnight Sun, since it’s so bloody bright all hours of the day and the night these days. Every once in a while, the stars align just right, and I’m able to peek in seconds after he posts. This time, I was watching for the right moment. yes, a spoiler warning on the Hobbit – or any book, really – would be quite absurd, Kaze! and yeah, Tiana’s known for her lightning-quick commenting speed. she’s a tough one to beat when she’s looking for a Firsting. I’ve always said that some spoilers are unnecessary. I think it’s OK for me to tell you that Darth Vader is Luke Skywalker’s father, for example 😀 Spoiler warnings on any book, old or not, if it came BEFORE the film would really rankle with me! oh, and new BOTshop coming soon (after i get back from vacation) with new tees and BOTtons. thanks for the interest! You should go to a con and get a Jefbot book. I got one at Emerald City Comic Con, I got to talk to the ‘Bot and the Cornfather, and they’re immensely nice guys. Wow, Hawaii! My friend’s a couple weeks away from coming back home from Hawaii! Hope you have a great time! and re: Hawaii – thanks! i’m sure a great time will be had! HaHa.. this is too much for me. no shame, supersonic cucumber: hopefully, the movies inspired you to read the books! re: “shocked.” heh. you and jefbot both, Insectoid! You are going to Hawai? And you are telling us in advance so you can hear our reactions? Thats just plin evil man. You and Xinda are definitely related. Speaking of which, is it a family trip or personal getaway? kind of a family get together and a personal getaway, Maryz! i’ll be visiting relatives on Mombot’s side of the family for a birthday and an anniversary this weekend, and hanging with a cousin or two during my stay here. but when i’m not hanging with family, i’m gonna try and get in some hiking, surfing and hanging with friends! Cartoon? When was there a… oh, do you mean the animated films? the animated film is so good, Maesonic. i watched it so many times (between reads of the book, of course) when i was a kid. I’m so replete with squee that Martin Freeman is Bilbo and Benedict Cumberbatch is doing Smaug’s voice that I don’t even care that four people have come up to the reference desk and asked if the book of the movie has come out yet. Okay . . . I care a little bit. But I’m not allowed to smack the patrons with rolled up newspapers. Peole asking that DESERVE to get smacked with rolled up newspaper – or perhaps even a book! Well, take their names and I’ll beat them severely with a encyclopedia! HAHAHAHA! I forgot about the VIDEO! It burns us! I’ve gone so far as to show them the copyright date of the book, but that’s about all I can do. Leonard Nimoy is to me all things . . . but the man was never a songbird. You mean idiots haven’t already taken over the government? I guess that one time I achieved the shades of firsting will be a one-time thing. Does that mean they put that huge spoiler warning tape on the Game of Thrones books too? “WARNING: SOMEONE DIES IN THIS BOOK”. Whenever I see a spoiler warning, I have an internal war; I could find out the major events in a story (I love stories in any form ^_^ ), but then I wouldn’t have it revealed the way the author intended. To put a spoiler warning on a book (especially one like the Hobbit) is to show the true depth of your stupidity. Oh poo, I almost forgot. Did you ever hear back from Sonitan, Jeff? Good one! I seriously hope this is a product of your imagination. I received a fabulous box in the mail yesterday full of wonderful Bot Goodies! Yay! Taran immediately put his Power of Scrawn shirt on and was showing it off to his friends who were over. Unfortunately, T-shirts are a bit too casual for work or I’d be wearing one of mine today. And I will be decorating my backpack with a couple of the BOTtons and putting the rest up at work. Maybe I’ll rotate them out periodically. 😀 Thanks. I love all the great merchandise! You rock! Sorry, I meant to say Have fun in Hawaii! It’s early and my brain is not quite moving yet. and, yes! definitely having an awesome time here in Hawaii. just taking a break to read some comments and post the new strip! I love it when people don’t realize something they love is based on a book. Or they know and can’t be bothered to read the source material. I had that issue with a co-worker, when I started reading some Iron Man graphic novels in front of him and he started complaining about not wanting spoilers for the movie. Oahu?! Wahoo! Take me with you! Have oodles of fun, but please, promise me one thing…please no pictures of you in a bot-thong…ok? Anywho, have a safe trip, great time, and I hope the weather is wonderful!! TY ty ty ty, good to be back…I was having serious withdrawals…have to catch back up on everything. We have “smart” phones, but are too cheap to pay for the constant wifi capability…or whatever…Anyway, I hope to get back in the swing of things on here WOO HOOO!! 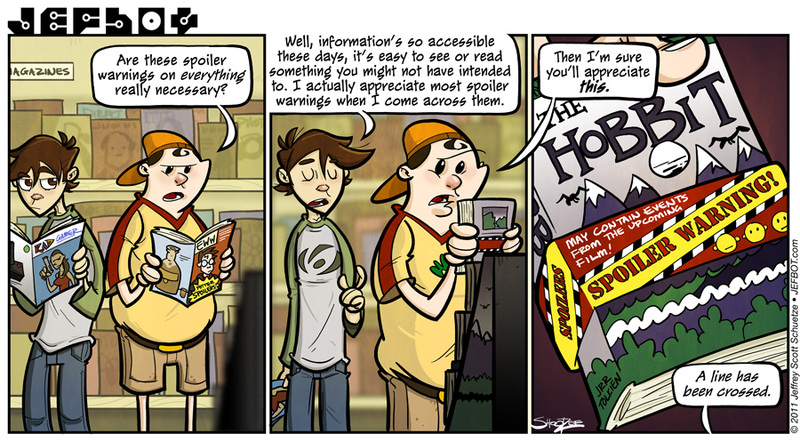 For me, catching up on all of the web comics I read wouldn’t be a problem. (even with the 40+ web comics I read) However, if my internet were to go out for an extended period of time, I would go nuts from not being able to play online with any of my friends on the 360. Sure there’s plenty to do single player, but that can get boring when you don’t have anyone to talk to for five or six hours. Have a great time! And, eat like an Asian while there! I’d love to retire to Hawaii if only for the food. Oahu is wonderful. You’ll love it! Love the title of Cornfather’s mag in the first panel: EWW. That says it all. I love this comic. But I went back and looked at the first comic. What the f***? Someone go back and look, you’ll see what I mean. heheh. yes, i’d really love to pull a Lucas and re-draw all those early strips, Jak. i’ve only resisted through sheer will power. *grumble grumble snarl growl* Morning. I’m here, just meh. Totes JEALOUS about Hawaii! Last weekend was fun..when we weren’t lost in St Augustine. Friggin GPS. St Augustine is an amazingly BEAUTIFUL place, I am totally moving there at some point. We saw the oldest schoolhouse in the nation as well as the oldest house. I LOL’d at the last panel. I wonder how long until they really do start doing that! I agree wholeheartedly that a line was crossed since that book has been out for 50+ years (probably not too precise on that date) before they even pulled movies on the trilogy. People are soooo freakin stupid these days…. Despite no one actually having said anything other than Game of Thrones. I have never seen a copy of the Hobbit with the same cover as mine. Spoiler warnings are so necessary. They should be on everything-tv,movie trailers, speaking.